A new joint acquisition by the Met and SFMOMA, William Kentridge’s five-channel video installation The Refusal of Time(2012) is a thirty-minute meditation on time and space, the complex legacies of colonialism and industry, and the artist’s own intellectual life. Kentridge was born in 1955 in Johannesburg, where he still lives and works. After drama school, Kentridge was active in theater and television production in the 1970s and 1980s. By the 1990s—coinciding with the abolishment of apartheid in South Africa—Kentridge’s live theater work and the stop-motion animated films he developed from charcoal drawings found an increasingly international audience. Kentridge’s recent interest in the nature of time was given focus through the work of Peter Galison, a Harvard-based historian of science. Galison studied a 1905 paper on relativity in which Albert Einstein hypothesized that, due to the delay in signals relayed via telegraph wire, peripheral railway stations synchronized on a centralized clock were forever fated to operate seconds behind schedule. Einstein’s nascent theories about the relativity of time converged with French mathematician Henri Poincaré’s development, as president of the Bureau des Longitudes, of global time zone maps at the dawn of the twentieth century. Both scientists faced the radical idea, in a newly industrialized and interconnected world, that time is not absolute but relative and resistant to control. At the center of the installation is a moving sculpture—the “breathing machine” or “elephant”—an organ-like automaton with a pumping bellows. Plans from the 1870s for copper pneumatic tubes under the streets of Paris that would pump regular bursts of air to calibrate the city’s clocks reminded Kentridge of a passage from Charles Dickens’s novel Hard Times (1854). Dickens describes a factory machine moving “monotonously up and down, like the head of an elephant in a state of melancholy madness”—a metaphor for the often convulsive developments in science and industry during the modern era and a reminder of the vain impulse to control time. 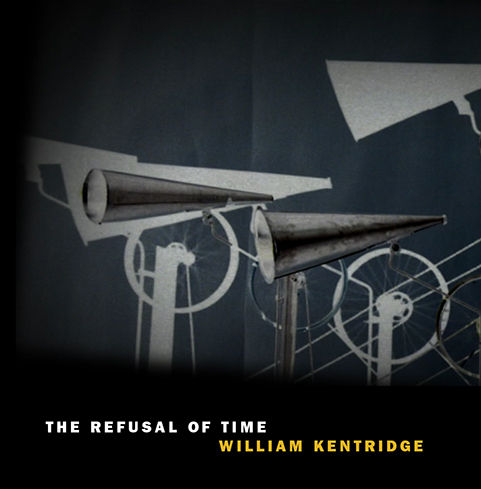 William Kentridge’s The Refusal of Time is a collaboration with Peter Galison, Catherine Meyburgh, and Philip Miller, and jointly owned by The Metropolitan Museum of Art, New York, and the San Francisco Museum of Modern Art. It was produced by Marian Goodman Gallery, New York and Paris; Lia Rumma Gallery, Naples and Milan; and Goodman Gallery, Johannesburg and Cape Town; and originally commissioned by Carolyn Christov-Bakargiev for dOCUMENTA (13), Kassel, 2012. Text is copyright Metropolitan Museum of Art.